So you’re designing a house? Maybe you’re renovating. Either way, if you are new to design, and architecture is foreign to you, then you run the risk of ending up with a design that you do not want. Ending up with a design that you are not happy with is time consuming and ultimately very costly to rectify. Therefore, it pays to know what you like and how you want to live in your house before you employ the architect or builder to do the job. West End local Mandy was faced with an interesting design conundrum. Having bought a classic West End Queenslander workers cottage with a friend, she found herself the proud owner of the ground floor. Thus, when she was ready to renovate, she was renovating just half a house. This was an intriguing situation that would take the most careful of touches and understanding of architects to get just right. There was no room for error. Quite literally. Mandy employed local architecture firm Surroundings to help get to know her own style. This may sound like a very basic concept, but it is in the simplicity of the service that the genius is found. Surroundings has developed a new service that fills a gap between client and designer. By all accounts, the design and building process can be a very long one, sometimes running over years. By the time a project is finished, Surroundings principal architect Suzie Wiley says she knows clients very well. The problem is, she wishes she knew clients as well as she did at the end right at the beginning — thereby making the design process a whole lot easier. Surroundings’ design program is called HOME, a name that puts ‘me’ in HOME. So how does it work? In Mandy’s case, the program was run by Suzie over four hours one Saturday at her soon-to-be-renovated cottage. 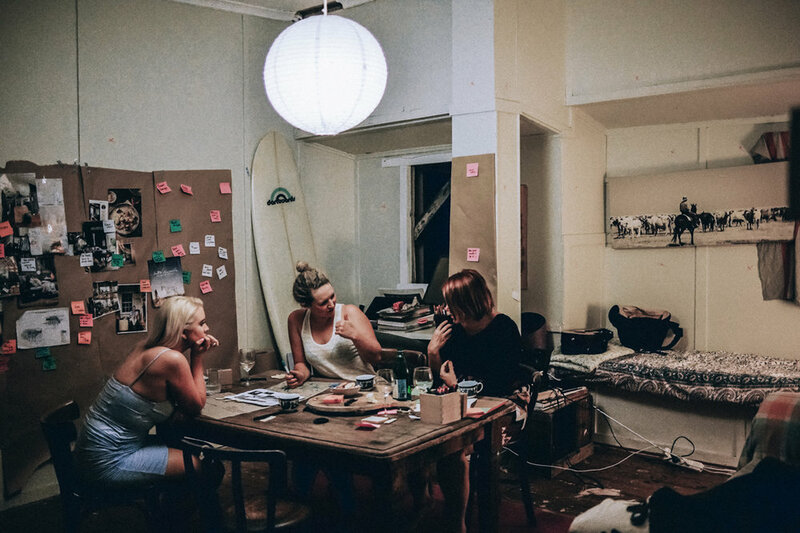 During this time Suzie facilitated a process by which Mandy was given the language and the visual prompts she needed to understand her own architectural preferences. By designing around the experiences that she wanted to have in her new home, they were able to work from the inside — the ideal experiential — to something that can be translated to the built form. From this process, Mandy knew that she wanted the kitchen to be the heart of the home; that she valued family and friend get-togethers and needed places to live out those wonderful social moments. This in turn helped Surroundings understand the very emotional fabric that needed to be woven into Mandy’s new home. Hey presto — client and architect are on the same page. Surroundings has a great deal of connections with small architecture practices around West End. Their idea is to facilitate more workshops like this, and once they understand the style of the client, to pass them on to another architect who matches their needs and completes the design. As for Mandy, her home will be completed soon, and much to her experiential satisfaction. Home Masterclass run by Suzie and Jon, with Mandy and her bestie Genevieve. Article first published in The West End Magazine in 2015. Words by Alice Thompson, photos by Jon Henzell. Surroundings Home Masterclass is a private session for you and your family or friends, which can be undertaken in the comfort of your own home, or in the creative environment of the Surroundings studio.